I watched the movie first which made me want to read the book. I enjoyed getting more information from the book which helped me understand why certain things were happening. It also made me see how the movie really chopped up the story and I wish they would have added in scenes so that Eilis and Tony's relationship didn't seem so rushed since it actually went on longer than I originally thought. ******SPOILER******* What bugged me about the book is that Eilis seemed to constantly question her feelings for Tony and it felt as if she was just going along with the relationship because she thought he was nice. Whereas in the movie it seemed like her feelings for Tony were genuine and equal to his but she was just shy about expressing them. In that regard I liked the way the movie portrayed the relationship better. I was also yelling at her a lot more in the book than when I was watching the movie. Overall the story was slow paced but enjoyable while I listened to it while working. 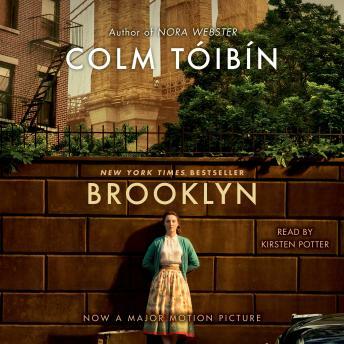 I loved Brooklyn the movie, so I decided to listen to the book. Overall I loved the book as well. It obviously has a lot more details the movie, which I enjoyed learning about. Some I wish they added in the movie, but I was actually happy with how the movie was adapted from the book. They took almost all of the good parts and left out what was not needed. I'm also prefer the ending to the movie verses the book. It tied everything up better. The narrator did a great job handling all the different accents and made listening to the book more enjoyable than reading it. Overall I enjoyed the book and would highly recommend it to others!